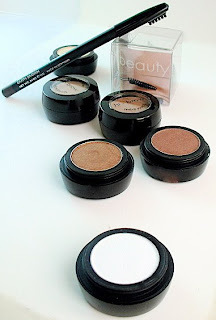 Recently we were able to interview the fabulous Elke Von Freudenberg, who just so happens to be having a new collection of eyebrow goodies coming out. Called The Elke® Brow Collection, it premiers August 3rd. She's amazing. She's gorgeous. She's phenomenal. And we positively love her here. Okay...now we're gushing...but seriously...she's worked on celebrities and she works in LA and NY. Lucky for us, she was able to take a break from her hectic schedule and answer some questions for us. In your opinion, what is the one mistake most women make when it comes to their eyebrows? In over 20 years of shaping eyebrows, I've noticed that women either do 1 of 2 things. They either pluck way too much, or they don't do anything at all! Some clients tend to pluck too much, or they do the 1/2 circle shape, which is a way of trying to create an arch which doesn't work. The arch never comes from the middle of the brow. It comes from the beginning to the arch. If there's not enough hair, it's very hard to create an arch. Or they don't do anything at all, afraid that they might ruin what shape they do have, but then they are left with no shape at all. Eyebrows don't have to be tweezed down to 2 rows of hair to look good. It's about creating and emphasizing the shape that your eyebrow is already doing and making it stronger. You get a very signature look that way that is yours alone. Okay...I've over-plucked...what should I do now? Leave them alone if you can for 2 weeks. Don't touch them. And then use your facial scrub on your eyebrows 1-2 times a week for about a month. You'll notice your eyebrows growing in. Also, don't feel you have to wait 3 months for your eyebrows to grow in before you can get your eyebrows on track again. I've easily reshaped and modified eyebrows 2 weeks after a tweezing mishap which can get your eyebrows back in shape again. Can we just tell you that "Elke" Brow Collection is amazing! What one item do you think every woman should have? Thank you! I love them all! It's hard to pick a favorite because it depends what your eyebrow needs are. If you're looking for something that works for stray hairs that you just don't want to tweeze, try the Eyebrow Tamer. It's a clear wax that grooms and gets unruly eyebrows to stay put. You can also draw your brow color over without worrying about colors mixing. I also like the Nite-Brow Shadows. Made specifically to glamorize your brows for night... the colors are specially designed for blonde, brunette, dark brunette and red brows to shimmer and sparkle at night! What are the top three beauty products that you can't live without? Only three? It would be my Kieh's Lip Balm, my Estee Lauder lip gloss (love that fig/vanilla scent, I'm addicted) and third; my Youngblood Concealer. That concealer works great for under eyes, without creasing and gives great coverage. Can you tell us the best piece of beauty advice you've ever received? Smile. Whatever you did makeup wise will only look prettier!